When one of the links is fixed in a kinematic chain, it is called a mechanism. So we can obtain as many mechanisms as the number of links in a kinematic chain by fixing, in turn, different links in a kinematic chain. This method of obtaining different mechanisms by fixing different links in a kinematic chain is known as inversion of the mechanism. When the two elements of a pair are connected in such a way that one can only slide relative to the other, the pair is known as a sliding pair. The piston and cylinder, cross-head and guides of a reciprocating steam engine, ram and its guides in shaper, tail stock on the lathe bed etc. are the examples of a sliding pair. 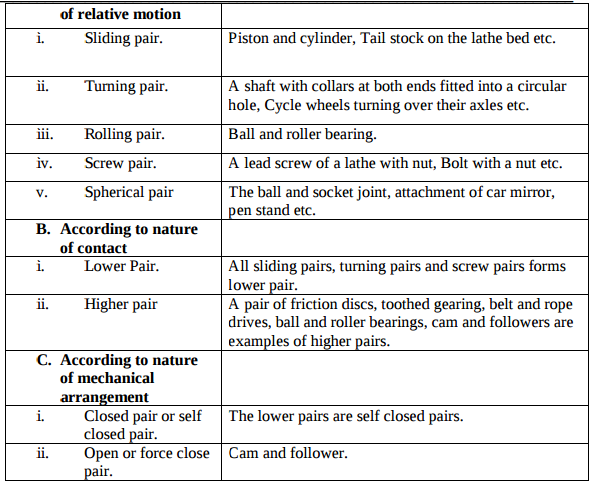 A little consideration will show that a sliding pair has a completely constrained motion. A freewheel mechanism on a bicycle allows the rear wheel to turn faster than the pedals. If there is no freewheel on a bicycle, a simple ride could be exhausting, because one could never stop pumping the pedals. And going downhill would be downright dangerous, because the pedals would turn on their own, faster than one could keep up with them. Power Train of a bicycle: The power train of a simple bicycle consists of a pair of pedals, two sprockets and a chain. The pedals are affixed to one sprocket — the front sprocket, which is mounted to the bike below the seat. The second sprocket is connected to the hub of the rear wheel. The chain connects the two sprockets. When you turn the pedals, the front sprocket turns. 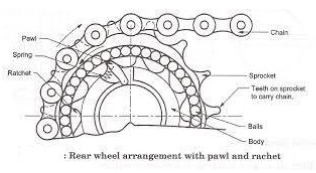 The chain transfers that rotation to the rear sprocket, which turns the rear wheel, and the bicycle moves forward. The faster you turn the pedals, the faster the rear wheel goes, and the faster the bike goes. Coasting: At some point — when going downhill, for instance — speed is high enough so that the rear wheel is turning faster than the pedals. That's when coasting: we stop working the pedals and let the bike's momentum keep moving forward. It's the freewheel that makes this possible. On a bicycle, instead of being affixed to the wheel, the rear sprocket is mounted on a freewheel mechanism, which is either built into the hub of the wheel — a "freehub" — or attached to the hub, making it a true freewheel. Now when you have to move forward, the pawl acts like a hook and gets locked with the teeth - called ratchet and transmits the torque. The complete mechanism is called ratchet and pawl mechanism. But when you reverse pedal, it falls back and becomes "free". A spring prevents it from falling permanently. This is the reason why you hear the distinct "click-click" sound when you reverse pedal. Also, there are multiple "pawls" placed along the circumference too. Pappu Define kinematic link and kinematic chain. a) Kinematic link: Each part of a machine, which moves relative to some other part, is known as a kinematic link (or simply link) or element. Kinematic Chain: When the kinematic pairs are coupled in such a way that the last link is joined to the first link to transmit definite motion (i.e. completely or successfully constrained motion), it is called a kinematic chain. 1. 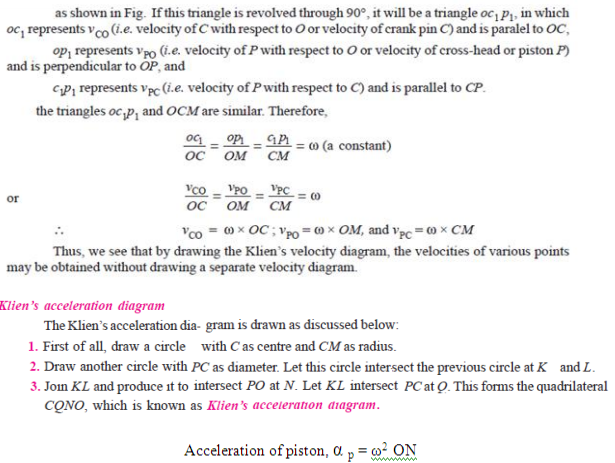 As no slip takes place, hence, perfect velocity ratio is obtained (Positive drive). 2. Chain drive gives high transmission efficiency (up to 98 %). 3. Chain drive may be used when the distance between the shafts is less. 4. Chain is made up of metal which would occupy less space as compared with belt or rope drive. 5. Ability to transmit power to several shafts by one chain. 6. Load on the shaft is less and long life. 1. Manufacturing cost of chains is relatively high 2. The chain drive needs accurate mounting and careful maintenance 3. High velocity fluctuations especially when unduly stretched 4. Chain operations are noisy as compared to belts. Examples: I.C. Engine, Machine tools, steam engine, type writer, etc. Roller follower is preferred over knife edge follower  Knife-edge of the follower will cause the wear of the cam.  Higher load on the small contact area the follower likely to cause wear at the tip of Knifeedge due to more stresses. 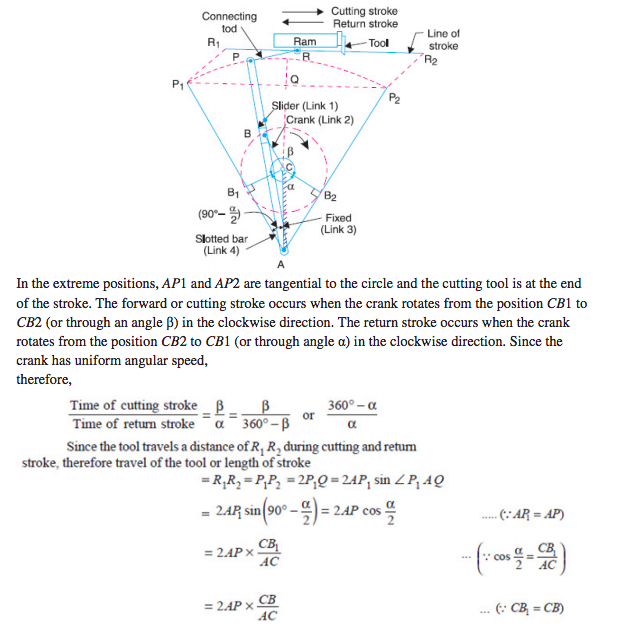  Knife-edge follower practically not feasible for higher torque / load applications.  More friction due to sliding motion of the knife-edge follower and hence, more maintenance.  Roller follower on the other hand produces smooth operation with less wear and tear of both cam and follower.  Pure rotational motion of roller follower causes less friction and less loss of power.  Considerable side thrust exists between knife-edge follower and the guide. also rotates at the same speed. This inversion is obtained by fixing the link 2, as shown in Fig. other. The tongues on the link 4 closely fit into the slots in the two flanges (link 1 and link 3). The link 4 can slide or reciprocate in the slots in the flanges. motion between the link 4 and each of the other links 1 and 3. Crank and slotted lever quick return motion mechanism. This mechanism is mostly used in shaping machines, slotting machines and in rotary internal combustion engines. In this mechanism, the link AC (i.e. 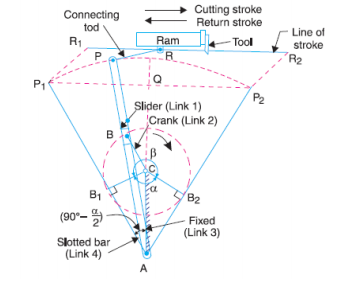 link 3) forming the turning pair is fixed, as shown in fig. The link 3 corresponds to the connecting rod of a reciprocating steam engine. 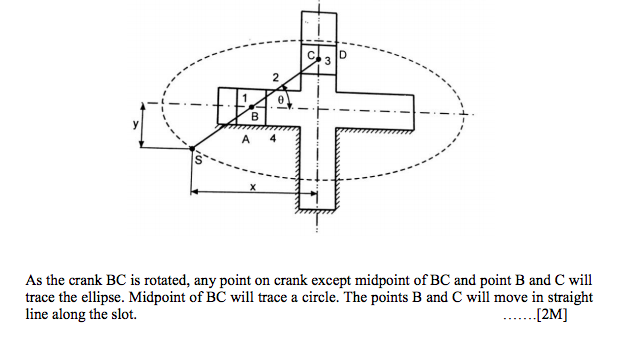 The driving crank CB revolves with uniform angular speed about the fixed centre C. A sliding block attached to the crank pin at B slides along the slotted bar AP and thus causes AP to oscillate about the pivoted point A. 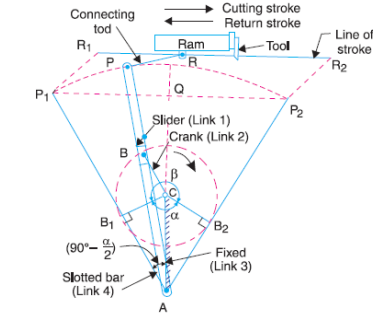 A short link PR transmits the motion from AP to the ram which carries the tool and reciprocates along the line of stroke R1R2. The line of stroke of the ram (i.e. R1R2) is perpendicular to AC produced. 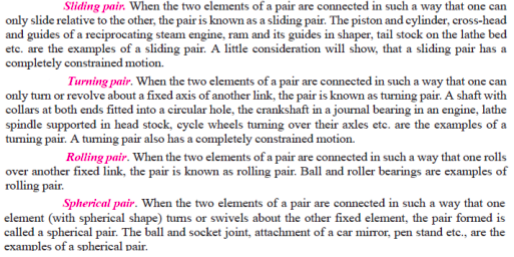 What are the types of kinematic pair ? Give its examples. 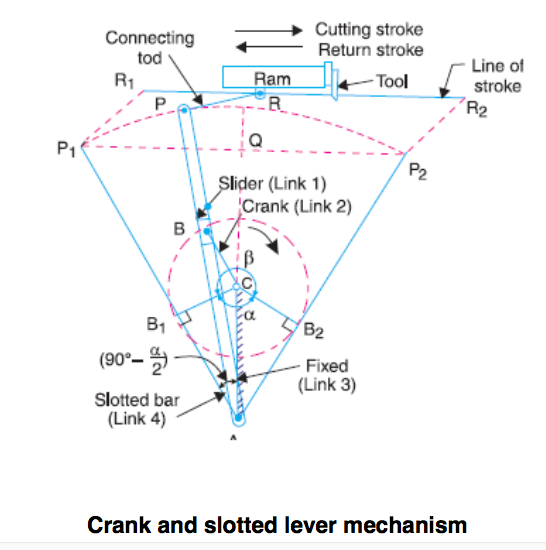 Different mechanism generated by single slider crank chain mechanism. 3.Slotted crank mechanism, Oscillatory engine. Each part of a machine, which moves relative to some other part, is known as a kinematic link. When the kinematic pairs are coupled in such a way that the last link is joined to the first link to transmit definite motion (i.e. completely or successfully constrained motion), it is called a kinematic chain. 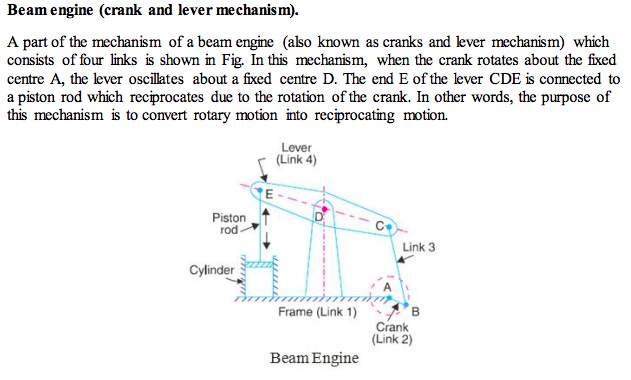 Crank OA of a mechanism is hinged at ‘O’ and rotates at an angular velocity of 20 rad/sec. 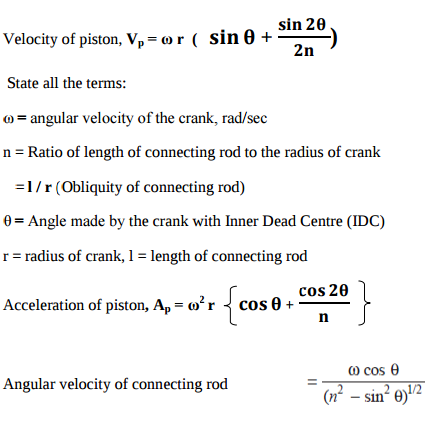 and angular acceleration of 25 rad/sec2 . 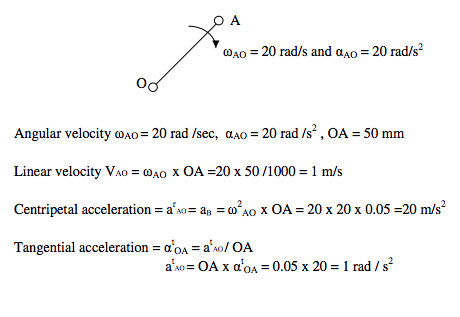 If crank OA is 50 mm long determine linear velocity, centripetal acceleration and tangential acceleration of a point A. This mechanism is mostly used in shaping machines, slotting machines and in rotary internal combustion engines. In this mechanism, the link AC (i.e. 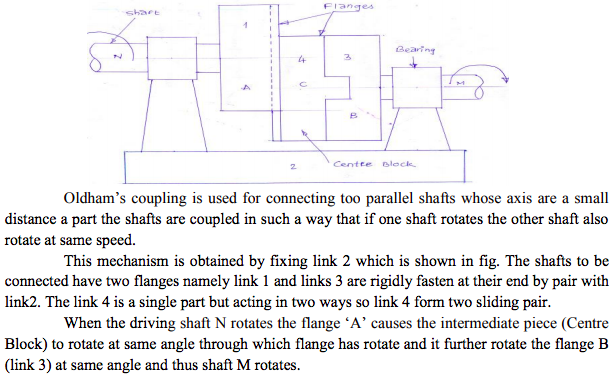 link 3) forming the turning pair is fixed, as shown in fig. The link 3 corresponds to the connecting rod of a reciprocating steam engine. 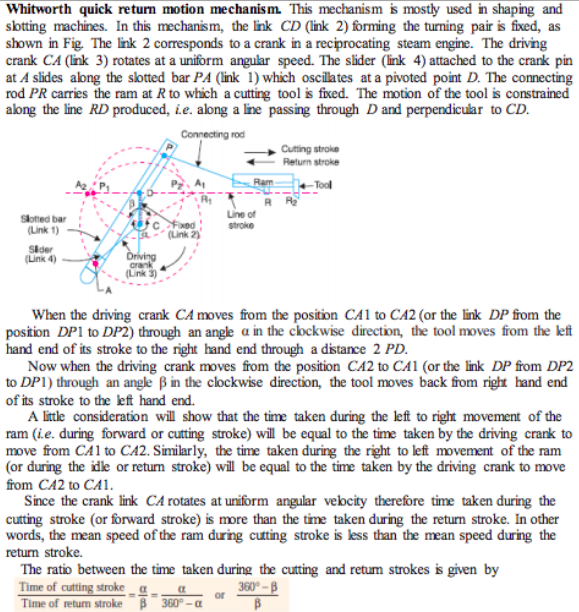 The driving crank CB revolves with uniform angular speed about the fixed centre C. A sliding block attached to the crank pin at B slides along the slotted bar AP and thus causes AP to oscillate about the pivoted point A. A short link PR transmits the motion from AP to the ram which carries the tool and reciprocates along the line of stroke R1R2. The line of stroke of the ram (i.e. R1R2) is perpendicular to AC produced. 1. Mechanism : When one of the links of a kinematic chain is fixed, the chain is known as mechanism. 2. Inversion of mechanism The method of obtaining different mechanisms by fixing different links in a kinematic chain, is known as inversion of the mechanism. So we can obtain as many mechanisms as the number of links in a kinematic chain by fixing, in turn, different links in a kinematic chain. 1. Completely constrained motion: When the motion between a pair is limited to a definite direction irrespective of the direction of force applied, then the motion is said to be a completely constrained motion. For example, the piston and cylinder (in a steam engine) form a pair and the motion of the piston is limited to a definite direction (i.e. 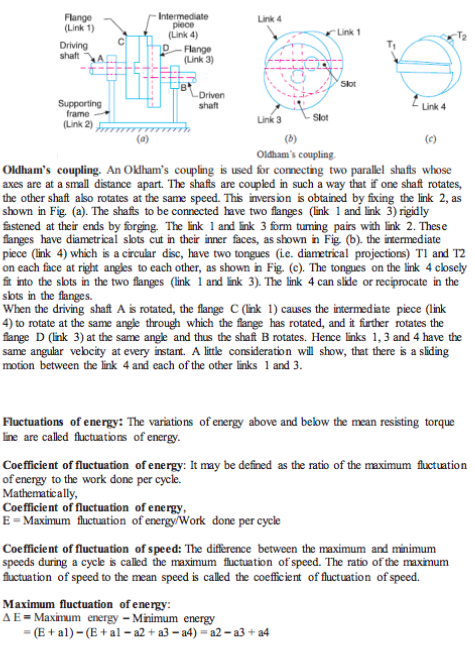 it will only reciprocate) relative to the cylinder irrespective of the direction of motion of the crank. 2. Incompletely constrained motion: When the motion between a pair can take place in more than one direction, then the motion is called an incompletely constrained motion. The change in the direction of impressed force may alter the direction of relative motion between the pair. A circular bar or shaft in a circular hole is an example of an incompletely constrained motion as it may either rotate or slide in a hole. These both motions have no relationship with the other. 3. 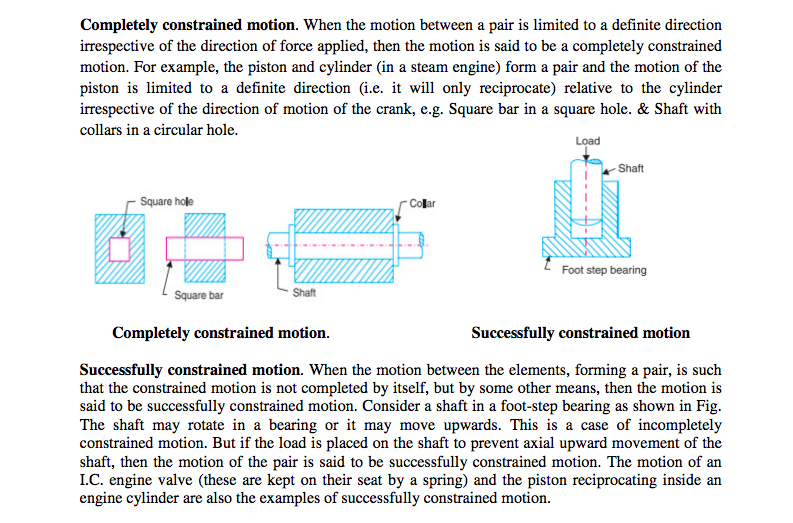 Successfully constrained motion: When the motion between the elements, forming a pair, is such that the constrained motion is not completed by itself, but by some other means, then the motion is said to be successfully constrained motion. Consider a shaft in a foot-step bearing. The shaft may rotate in a bearing or it may move upwards. This is a case of incompletely constrained motion. 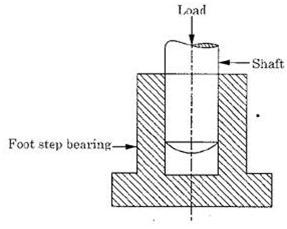 But if the load is placed on the shaft to prevent axial upward movement of the shaft, then the motion of the pair is said to be successfully constrained motion. 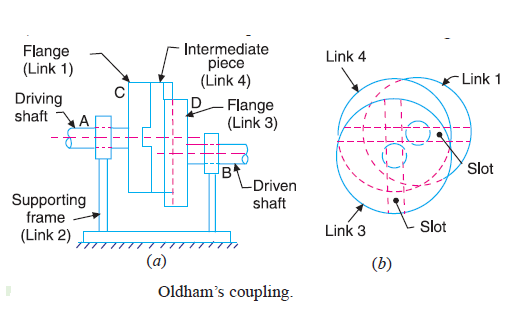 An Oldham's coupling is used for connecting two parallel shafts whose axes are at a small distance apart. Used to transmit motion and power.